One day, Scott Lobdell, Dexter Soy, and Veronica Gandini found themselves itching for an exciting new experience. So what they did was to get themselves deliberately arrested and then escape from the authorities as quickly as possible. 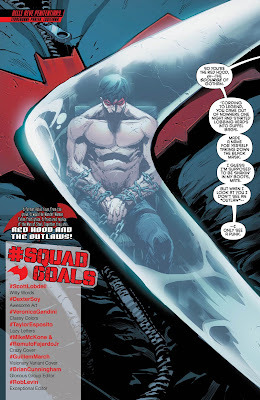 While they were doing this, they also created the following issue of Red Hood and the Outlaws! It's November, 2017, and I think it's time to brush up on our lock picking skills. TO QUOTE Jeanne Calment: “In life, people sometimes make rotten deals”. 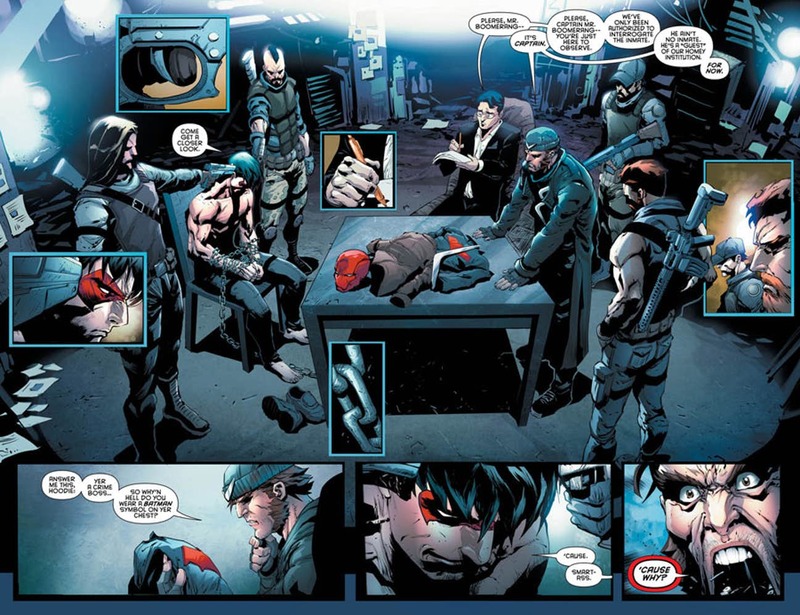 After being defeated by Batwoman and her team, Red Hood and the Outlaws unfortunately find themselves imprisoned inside Belle Reve Penitentiary, Louisiana, which is also the infamous residence for the covert action team, Task Force X, AKA the Suicide Squad, plus their De facto leader, Amanda “The Wall” Waller. 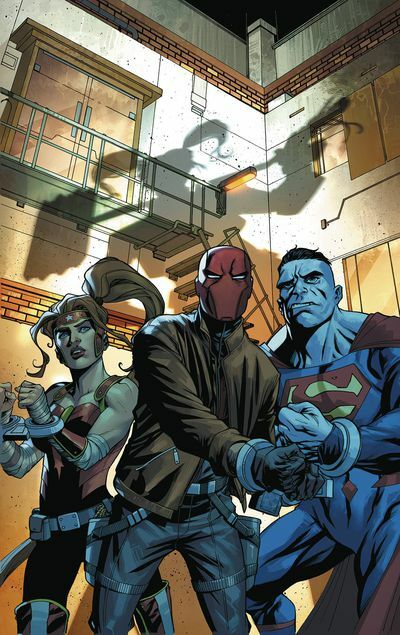 But as we all know, the likes of Jason and Artemis aren't going to take their incarceration lying down, and soon enough, they manage to overpower the prison guards and their respective handlers, namely, Captain Boomerang and Harley Quinn, only to find themselves free and on the lookout for their missing member, Bizarro. But will they find him? And if they do, will their search give them much more than what they bargained for? To find out, please pick up issue 16 of Red Hood and the Outlaws today! Now, after a somewhat disappointing last issue, I'm glad to say that Scott Lobdell is back on top form with this month's adventure. Not only does he make a great use of a very suspenseful premise, but unlike last time, he doesn't try to force the plot onto the characters in an unrealistic way. On the whole everything seems to flow very naturally, smooth even, and this gives us a satisfying story that mixes both action and character moments in equal measure. My favorite part of the book was that 'meta moment' presented to us in a scene between Artemis and Harley, as it questioned the overwhelming presence of the Joker’s ex-girlfriend on DC’s current output. I also liked the way that Lobdell built this story by basing some of it on his old work on the Teen Titans title, without forgetting to mention a subtle reference to Roy during Jason and Killer Croc's meeting. Having said that, though, I did find a couple of flaws to his writing, mainly, how the guest characters seem rather extraneous to the story Lobdell wants to tell. From my point of view you could completely remove or replace both Batwoman’s team and the Suicide Squad with zero impact on the plot. Sure, my feelings could change in the next few issues, but at the moment this cameo-riddled story-arc feels fairly superficial, almost as if the guest stars have been included to boost sales rather than make a significant impact on the story itself. On a more positive note, I must applaud the wonderful artwork that's been lavished on this book. As expected, Dexter Soy takes full advantage of the Suicide Squad's guest appearance, and uses them to spice up his work by drawing character types that are rarely featured in this series: Like Croc for example, with his hulking big frame, or the svelte and nimble body of Harley Quinn. Likewise Veronica Gandini doesn’t allow herself to be upstaged as she uses her color palette in a very striking fashion: ranging from Harley’s ghastly white skin all the way to Boomerangs tacky blue costume. First class. Without giving too much away, there was a scene in this issue where we saw Bizarro making a deal with Amanda Waller, which, as we all know, is a character who doesn’t make deal's unless it benefits her somehow. In turn this reminded me of the infamous Robert Johnson song, 'Cross Road Blues', although I hope the Outlaws will walk away from their deal a lot better off than the characters sung in Johnson's musical melody. Following on from this line of thought, that being Bizarro’s deal with Waller, and I couldn’t help but think of Bizarro like a cunning salesman offering his wares to the highest bidder. Well, as is often the case with good salesmen, I’m sure Bizarro has something up his sleeve in order to maximize his profits (much to Waller’s surprise). So far 'Bizarro Reborn' has been an uneven story arc, with a strong start and then a sloppy second issue. Luckily for us this third issue is back to the standards of the first one, as it paints an exciting prospect for the rest of the arc.